Where to Buy Ramik Green Bait Packs, Ramik Green Bait Packs 4 Lbs Resealable Pouch - $17.95 for Sale with Fast Free Shipping! 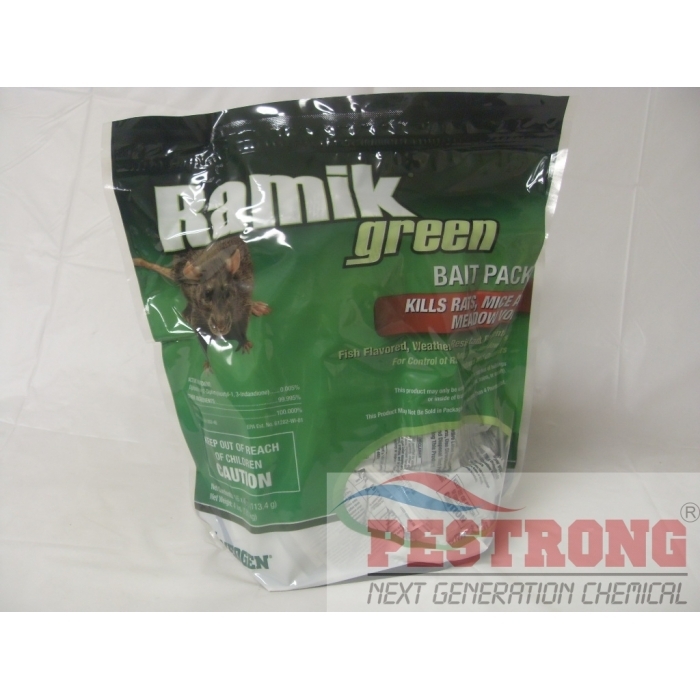 Ramik Green Bait Packs 4 Lbs Resealable Pouch are formulated without wax for high palatability and weatherability. Ramik Green bait system uses food processing technology to produce an unusually palatable and highly-attractive bait that retains its freshness, sweetness and effectiveness in a long-lasting nugget form. Nuggets are hot-extruded so they are weather-resistant without the use of wax. Resealable pouch helps maintain freshness. Ramik Green nuggets in convenient, ready-to-use bait packs. No need to touch bait; rodents will gnaw open the packs. Good effect at a great price. Resealable bag is great at keeping the baits fresh and effective.